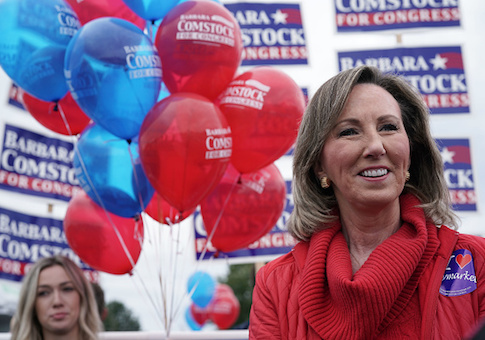 Rep. Barbara Comstock (R., Va.) is tied with her Democratic opponent, according to new polling exclusively obtained by the Washington Free Beacon. A TargetPoint consulting memorandum shared with the Free Beacon found Comstock and Jennifer Wexton in a dead heat, with each candidate pulling in 47 percent. The poll shows a much more competitive race in a district categorized as leaning Democratic. Public polls from the New York Times and the Washington Post show Comstock trailing anywhere between 7 and 12 points. The memo also reveals Rep. Mimi Walters is pulling away from her Democratic opponent Katie Porter in California's 45th district, which is currently rated a toss up. Walters has an 8-point lead, according to the memo. TargetPoint surveyed likely voters in eight districts, finding Republicans with leads in five districts and tied in one. The survey, which was conducted in the field from Oct. 14-16, was commissioned by a variety of TargetPoint consulting clients who did not wish to be disclosed. Other districts surveyed saw Republicans pulling away, including Rep. Elise Stefanik, who leads Tedra Cobb 50 to 40 percent in New York's 21st district. In Ohio's 16th district, Republican Anthony Gonzales has opened up a 9-point lead over Susan Moran Palmer, at 48 to 39 percent. Dan Crenshaw also has a 9-point lead over Democrat Todd Litton in Texas's Second Congressional District, leading 49 to 40 percent. Denver Riggleman (R.) leads by 5 points over Leslie Cockburn (D.) in Virginia's fifth district, another race that has been labeled a toss up. Republicans trailed in two races, though by slim margins. The "Clinton-leaning" Pennsylvania first district has Republican Brian Fitzpatrick within 4 percentage points of Scott Wallace, who recently dropped an F-bomb during a debate in a synagogue. Wallace is up 49 to 45 percent. "Independents are still in play here for persuasion—a group where Fitzpatrick trails by 6," according to the memo. "Fitzpatrick is trailing among those who are extremely likely to vote but leads with voters who say they have already cast their ballot 54 percent—46 percent." Colorado's sixth district, which is rated as leaning Democratic, is also tightening. Republican Mike Coffman trails Democrat Jason Crow by 5 points. However, Coffman is winning early voters by a margin of 54 to 46 percent. The top issues for voters two weeks out of the midterms are health care and immigration, TargetPoint found. "Voters were asked which issue was the most important in deciding their vote and six of the districts surveyed showed health care as their most important issue," according to the memo. "Two of the districts had immigration as the top issue for voters. In TX-02 immigration and health care tied as the most important issue." President Donald Trump had net positive favorability ratings in five of the eight districts surveyed. In polls where Republican candidates were leading, the president had "overall positive numbers." Districts with positive ratings for Trump included New York 21st, Ohio 16th, Texas 2nd, California 45th, and Virginia 5th. While Trump has seen his favorability rating on the rise, voters are strongly rebuking House minority leader Nancy Pelosi (D.). "Not a single district survey showed Minority Leader Nancy Pelosi with positive favorability numbers," TargetPoint found. "Voters with an unfavorable opinion of Pelosi are choosing Republican candidates more than 3 to 1."